WHAT: The University will host Father Eric Hollas, O.S.B., deputy to the President in the Office of Institutional Advancement of Saint John’s University in Collegeville, Minn., to speak about the artistry of the Saint John’s Bible and its ability to convey religious ideas. The first completely handwritten and illuminated, multi-volume Bible commissioned by a Benedictine Abbey since the advent of the printing press, the Saint John’s Bible weaves together word and image in a powerful way. 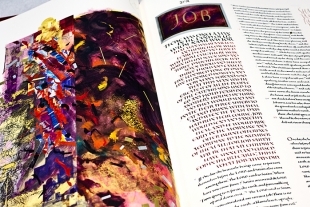 Saint Joseph’s University is the only institution in the Philadelphia region to own a copy of the limited Heritage Edition, a full-size, fine art replica of the original Saint John’s Bible. Refreshments immediately following in Wolfington Hall. WHO: All are invited. Please plan to join us! For more information, please contact Christopher Dixon, Archival Research Librarian, Drexel Library: “cdixon@sju.edu” or 610-660-2164.